Outbreaks of potentially toxic algae in U.S. lakes, rivers and other waterways rose by at least 40 percent this year compared to 2017, according to EWG’s tracking of news reports. Although some states, like New York and Florida, are still seeing algae on many of their waterways, algae outbreak season is winding down for most of the U.S. Between January and October, we’ve tracked reports of a record 239 algae outbreaks – a big jump from the 169 outbreaks in all of 2017. 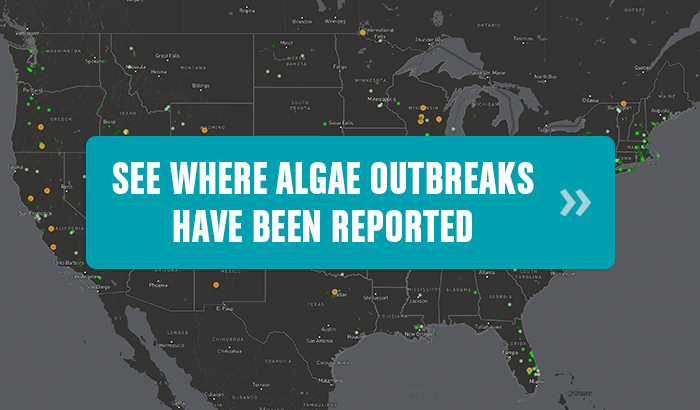 EWG’s newly updated story map has recorded 510 reports of algae outbreaks since 2010. That year, there were just seven reports of outbreaks. Outbreaks of blue-green algae, which are actually microscopic organisms called cyanobacteria, occur when nitrogen and phosphorus from fertilizer and animal manure run off farm fields and get into lakes, rivers and streams. Rain and heat combine with the pollutants to make the problem even worse. Some cyanobacteria turn toxic, threatening the health of people and animals who come into contact with the water. If the bacteria get into drinking water supplies, tap water can become unsafe to drink. The huge number of algae outbreaks that have occurred this year is likely the result of a perfect storm of farm pollution, hotter temperatures and more rain. This summer was the fourth hottest ever recorded in the U.S., and precipitation amounts were above average across the country, with some regions having their wettest summers ever. Climate change will continue to cause hotter and wetter summers throughout the country. To prevent another huge algae outbreak season next year, lawmakers must act to stem the tide of farm runoff into water. Regulations are needed that mandate basic standards requiring farmers to implement conservation practices to reduce water pollution. The safety of our drinking water and the health of our recreational waterways depends on lawmakers setting these basic standards.